The United Center welcomes you to Lexus Club Membership! We’re excited to have you joining us for the six-time Stanley Cup Champion Chicago Blackhawks and the six-time NBA Champion Chicago Bulls, along with world class concerts, exciting family entertainment and other special events. Lexus Club Membership provides you with many benefits and services. Amenities include fine dining at the exclusive Stadium Club restaurant, in-seat waiter and waitress service, complimentary reserved parking, theater-style seats, lounge areas and the opportunity to purchase tickets to other public events. The Lexus Club is committed to delivering exceptional convenience, comfort, value and service. The United Center’s Premium Seating Department is ready to assist you in any way we can. Please call or email us with questions you may have about your membership. Our goal is to exceed your expectations and make your experience as enjoyable as possible. This handbook is designed to enhance your membership. Please note that these guidelines, procedures and policies are subject to change at the discretion of the United Center or team management. Each team’s Club Members will receive their digital tickets for every preseason and regular season home game at least one week before the first game, along with the complimentary parking passes. Each team’s Club Members also have the opportunity to purchase their same seats for every home playoff game. Club Members have the opportunity to purchase tickets to most other United Center events open to the general public (non-Blackhawks/Bulls). On occasion, there may be events where it is not be possible to offer tickets due to the policies of an artist, promoter or presenting organization, limited seating capacity or other unique circumstances. As a result, the United Center reserves the right to refrain from offering tickets to any public or private event. When offering Club Members the opportunity to purchase tickets andparking passes to other events, the United Center will communicate via email in advance of tickets going on sale to the general public. Every Club Member must have a valid email address on file, and the United Center cannot be responsible for notifications blocked by spam filters or returned as undeliverable. In the event notification email, Lexus Club Members will be directed to log in to their United Center ClickTix account. Once logged into their account, they will go to Buy Premium Seating and find the respective event on the list. They will be given several sections of seats to select from and can choose the seats they would like to purchase for that event. They will be limited to the number of season tickets they hold. For some events with great demand or very limited availability, some seats may need to be assigned in the 300 Level. What If I’m Late or Don’t Respond to the Event Notification? If the required response to the Event Notification email is not received by the deadline, that will be considered as “No Interest” for the event. Due to limited processing time and ticket availability, late orders cannot be accommodated. Many simple account updates can be made online through ClickTix located on ChicagoBlackhawks.com and Bulls.com. Requests for changes can also be made by sending an email to premiumseating@unitedcenter.com. Blackhawks and Bulls Club Members are responsible for notifying their respective team of any changes to the contact name, mailing address or email address. All requests for changes are subject to approval by the respective team. Each team’s Club Members have the opportunity to purchase seats on a first-come, first-served basis. Club Members who do not receive their same seats will be relocated to the next best available seat locations on the 200 or 300 Levels. Please note that for some concerts, the artist may announce the addition of a second or third show at a later date. In those cases, Club Members will not have the opportunity to purchase tickets for those added dates. Extended Performance Events (Ice Shows): For performances which take place over several days, and which often have multiple shows per day, all Club Members will have the opportunity to purchase tickets for a variety of dates and times. Depending on the stage configuration, some seats in the Lexus Club may have an obstructed view. Obstructed view seats are determined by the performer(s) on an event-by-event basis. Generally, for 180° stage events, Sections 220 to 232 are assumed to have an obstructed view of the stage. For 270° stage events, Sections 221 to 231 are assumed to have an obstructed view. Club Members with obstructed views will be given the option to purchase the next best available seats on the 200 or 300 Levels for those events. A valid credit card will be required at the time of purchase on United Center ClickTix. Any tickets purchased for a special event can be digitally managed through the Lexus Club Member’s United Center ClickTix account following the general public on-sale for that event. Physical tickets and parking passes are no longer mailed. Blackhawks and Bulls Club Members with two to four tickets receive one complimentary, reserved parking pass for all home preseason, regular season and playoff games. Club Members with five seats or more receive two parking passes. Parking passes will be downloaded into each Club Member’s team ClickTix account at least one week before the first scheduled home game. Club Members receive reserved parking in well-lit, fenced-in and clearly marked lots adjacent to the United Center. Parking for Club Members is located in Lot C (off Madison Street) and Lot K (off Adams Street). Parking passes are valid for one space each. Club Members who purchase tickets to other United Center events will also have the opportunity to purchase one preferred parking pass for those events. The Lexus Club offers members exclusive use of The Stadium Club. This spectacular 225-seat restaurant features an upscale and delicious buffet for private entertaining and socializing. Generally, The Stadium Club opens two hours prior to events and remains open up to one hour afterward for drinks and desserts. Dining reservations are available to Club Members on a reservation-only basis (first-come, first-served). No reservations are necessary for the bar area. When The Stadium Club is at full capacity, Levy Restaurants reserves the right to limit the number of Club Members and guests. To make reservations at The Stadium Club, please call (312) 455-CLUB (2582). Reservations are limited to one per event and can be made up to two weeks in advance (10 business days) between 9:00 a.m. and 5:00 p.m., Monday through Friday. The Club Member’s name, section, row, seat number, telephone number and number of guests must be provided when making the reservation. Only Club Members on file with The Stadium Club can make reservations. To authorize another name on your account, please contact The Stadium Club at (312) 455-CLUB (2582). 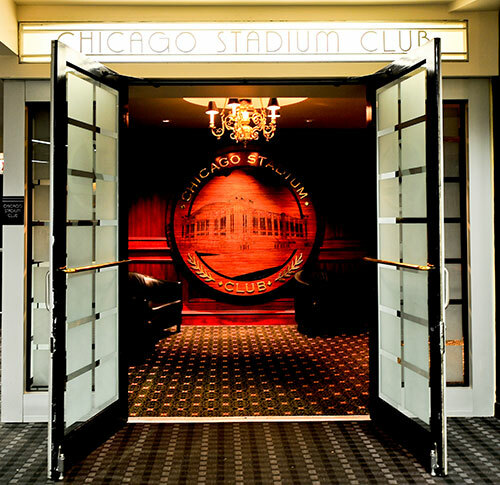 During Blackhawks games, The Stadium Club is available to Blackhawks Club Members only. For Bulls games, the restaurant is available to Bulls Club Members only. For non-team events, when the restaurant is open, all reservations are accepted on a first-come, first-served basis. Due to limited space, reservations will be held up to 15 minutes past the scheduled time. To cancel a reservation, or to inquire about last minute availability, please call (312) 455-CLUB (2582).Every effort will be made to accommodate late reservations. Most tables in the dining room are set up for parties of 2 or 4. However, a limited number of tables for 6 are available. Larger parties will be accommodated on a space available basis. Because The Stadium Club serves alcohol, all children under the age of 21 must be accompanied by an adult. A limited menu for children is offered. Business casual is recommended. Blue jeans, tailored shorts and team jerseys are acceptable, but running shorts, cut-offs, sweatpants, torn jeans and t-shirts are not allowed. It is important for Club Members to advise their guests about the dress code. The Stadium Club accepts Visa, MasterCard, American Express and Discover Card. Cash payments are also accepted. The club does not accept personal checks. Adams Street side of the building. After taking the escalator or stairs up one level, access to the Lexus Club requires 200 Level tickets. If guests of Club Members dining at The Stadium Club have 100 or 300 Level tickets, they can gain access by checking in at Gate 7 where a reservation list will be maintained. For Blackhawks and Bulls games, all gates typically open 90 minutes prior to game time. Club Members and their guests who have dinner reservations prior to gates opening can gain access through Gate 2 or 7. When leaving the Lexus Club Level, be sure to take your tickets with you to ensure re-entry. And please remember that after exiting the United Center, there is no opportunity for re-entry. Following the conclusion of most United Center events, the Lexus Club and lounge areas will be cleared in a timely fashion consistent with other United Center seating levels. However, The Stadium Club will remain open up to one hour after most events for guests who wish to enjoy a drink or dessert, or wait until traffic clears. Please note that this is subject to change on dates when there are multiple events or under special circumstances. Once Lexus Club Members purchase tickets to any special event there are no refunds or exchanges. Similarly, there are no refunds or exchanges on Blackhawks or Bulls tickets. For the safety and enjoyment of all Club Members, bad language or disorderly conduct will not be accepted. Using the United Center’s "Fan Assist Program," any problem related to fan behavior can be sent to United Center security by texting ucassist (add one space), followed by the seating section, row and a brief description of the issue to 69050. Security personnel will address the issue while maintaining the confidentiality of anyone sending a message. United Center prohibits all backpacks and hard-sided bags, along with any other bags (including briefcases, luggage, purses and diaper bags) that are larger than 14”x14”x6” in size. Single-compartment drawstring bags and fashion backpack purses will be permitted. Please note that all approved bags are subject to inspection upon entry, and the United Center is unable to check or store prohibited items during the game. The Box Office and will call can be found inside the East Atrium building. Tickets to most United Center events can be purchased at the Box Office, UnitedCenter.com, the team websites (ChicagoBlackhawks.com and Bulls.com) or Ticketmaster.com. Seating charts are available here. BMO Harris ATMs can be found in the concourses by Sections 117 (near the team store), 221 (near The Stadium Club), 327 (near Guest Services), inside the box office lobby (East Atrium) and inside the Atrium (southeast corner). For games, cameras and tablets (iPads) are allowed in the United Center. Video cameras are also allowed but cannot be used to record any game action. Tripods of any kind are not allowed. Laptop computers are not allowed. Policies are subject to change, please call for specific event details. Children 36” or over in height must have a ticket for admission. For most events, any child under this height entering without a ticket must share a seat with an accompanying adult. However, some events may require every person to have a ticket. The Bull Market/Blackhawks Team Store is located on the 100 Level across from Section 117. Satellite merchandise stands are also located throughout the arena. The team store is typically closed for non-team events. The Madhouse Team Store, located inside the United Center’s East Atrium is open on non-event days from 10:00 a.m. until 6:00 p.m. and on event days from 10:00 a.m. until one hour post event. The United Center offers first-aid services with a registered nurse and paramedics on duty for most events. The two first-aid stations are located on the 100 Level near Section 115, and on the 300 Level near Section 327. The City of Chicago’s non-smoking ordinance prohibits any type of smoking anywhere in the United Center. Penalties may result if a guest is found smoking inside the building. The city’s ordinance requires all smoking to be outside. To accommodate this, an area outside of Gate 7 on the 100 Level has been designated for smoking. Guests may smoke in this area and re-enter the United Center. Outside food and drinks, coolers, bottles, cans, laser pens, pointers and laptop computers are not permitted. United Center prohibits all backpacks and hard-sided bags, along with any other bags (including briefcases, luggage, purses and diaper bags) that are larger than 14”x14”x6” in size. Single-compartment drawstring bags and fashion backpack purses will be permitted. Please note that all approved bags are subject to inspection upon entry, and the United Center is unable to check or store prohibited items during the game. Certain events may expand the list of items prohibited. Lost items can be turned in or claimed at the Guest Relations Booths located near Gates 2 and 6. To report a lot item, go to https://www.unitedcenter.com/lost-and-found/. Items left over 7 days will be donated to charity. Day-of-Event Rental Suites can accommodate 20, 40 or 80 guests. Rental Suites include tickets, parking passes, the choice of food and beverage packages with an open bar, along with dedicated attendants. Meeting Rooms are also available. For information, call (312) 455-4119 or go to www.unitedcenter.com/rentalsuites.